When I need to leave my laptop for a moment, I always hit Win+L to lock the screen. It's almost a reflex by now, one quick flick usually done when I'm halfway out of the chair. But what if I wanted the computer to do something else when idle, or even execute a sequence of operations depending on how long I've been away? That's what System Silencer is for. System Silencer lets you control in minute detail what your computer does once you leave it idle. This unassuming piece of freeware lays out all it can do right on the main window. There are very few nooks and crannies to explore. The interface consists of a list of 11 different operations you can have your computer do once it's been idle for a while. You can set the interval before an operation is executed, and can even have it execute only if the computer is running on battery power (or only if it's connected to power). 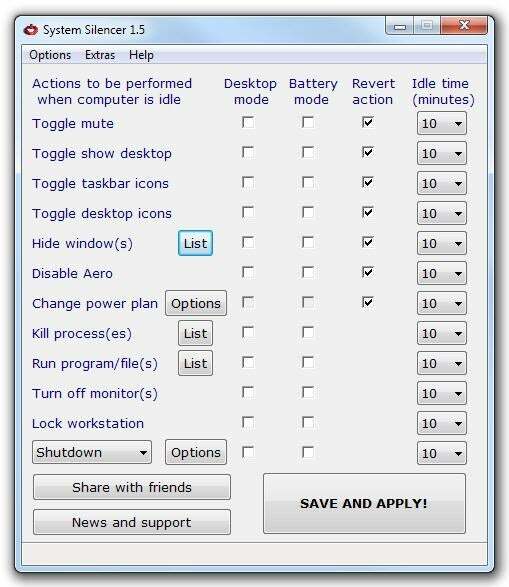 A couple of the operations can be done with Windows as it is: System Silencer lets you lock the workstation or turn off the monitor after a period of time has elapsed. Both of these can be done with Windows' own settings. You might say System Silencer provides a more fine-grained way to control them, because you can have them occur only in certain power modes (desktop or battery). The other operations are more unusual: You can have the computer mute the sound once you're gone, and automatically unmute it when you come back. You can minimize all windows so that your desktop shows. You can even hide specific windows--a sneaky way to make it look as though you've got nothing to hide (you didn't even lock the computer), while in fact stashing away an app or two. One option for which I do not see a clear use case is disabling Aero. You can have your computer disable Windows' swanky translucent-looking interface when you leave it alone, and then switch the interface back on once you're back. Some say this can be used to conserve battery life, but that's a myth that has long been debunked. When enabling an operation, you must remember to tick the boxes for the power modes you want it to apply to. By default, neither power mode is selected, so you can configure an interval for an operation and then wonder why it didn't go off as planned (this happened to me). The main thing I like about System Silencer is that you can stagger operations and get a "gradual shutdown." You can have it minimize your windows and mute the sound 30 seconds after you're gone, lock the workstation if you're not back in two minutes, and then turn off the screen if you're still gone after five minutes. All in all, this is an effective system utility, especially given its price tag marked "free." If you ever need to do anything more complex than just locking the workstation when you leave, do give System Silencer a spin.